Ocean China is a local restaurant serving authentic Chinese cuisine. Established in September of 1994, we remain committed to providing our customers with fresh food and friendly service. Your satisfaction is our satisfaction. For groups of 7 or larger, please call ahead (918) 335-0022. Catering available, please call for details. 3401 E Frank Phillips Blvd. Shredded cabbage, carrots and celery with pork in a thin, crispy spring roll skin. Deep fried pastry filled with cream cheese and imitation crab meat. Savory ground pork and cabbage wrapped in flour dough, steamed and served with a vinegar sauce. Slices of choice flank steak, marinated in a sweet, savory sauce, served on skewers. St. Louis Style Pork Ribs in our own Chinese BBQ sauce. Peppery and sour. This soup contains pork, tofu and bamboo shoots. Shrimp, scallops, imitation crab meat and vegetables in a chicken broth with a hint of ginger, served with sizzling rice. Silken bean curd with vegetables a chicken broth with a hint of ginger. Chopped chicken white meat, cream corn and egg in flavorful chicken broth. 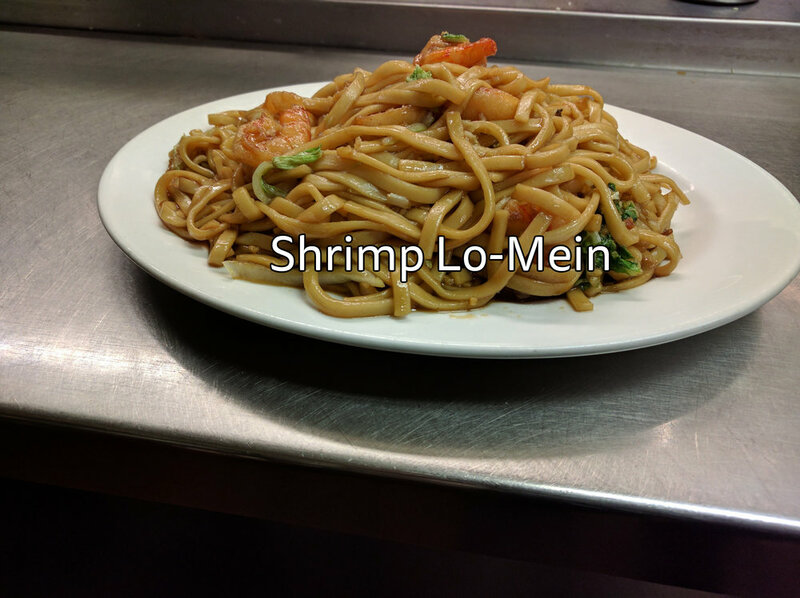 Sautéed large shrimp, tossed with ginger, green onion, and seasoned salt and pepper. Large shrimps sautéed with green onion, ginger and garlic. Large shrimps sautéed in a tangy sweet and sour sauce. Bone-in marinated duck, steamed, then deep fried until crispy. Slices of chicken white meat sautéed with fresh mushrooms and green onions in a spicy brown sauce with a sweet touch. 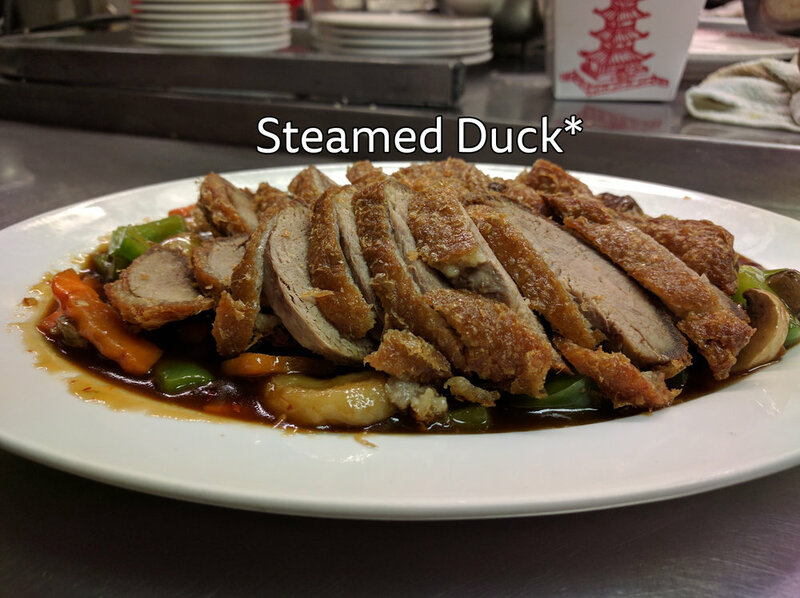 Steamed, boneless marinated duck served on a bed of vegetables in Szechuan sauce. Shrimp, chicken, beef, and vegetables stir-fried in brown sauce. Slices of choice flank steak sautéed with yellow onions in an aromatic sha cha sauce. Slices of choice flank steak sautéed with fresh mushrooms and green onions in a spicy brown sauce with a sweet touch. Stewed fried bean curd in an aromatic curry sauce. Fried bean curd, stewed with dry shiitake mushrooms, baby corn, and water chestnuts in brown sauce. Bite-sized chicken dark meat cooked with dry shiitake mushrooms, baby corn, and water chestnuts in brown sauce. Chicken dark meat stewed with red pepper and yellow onions, simmered in an aromatic curry sauce. 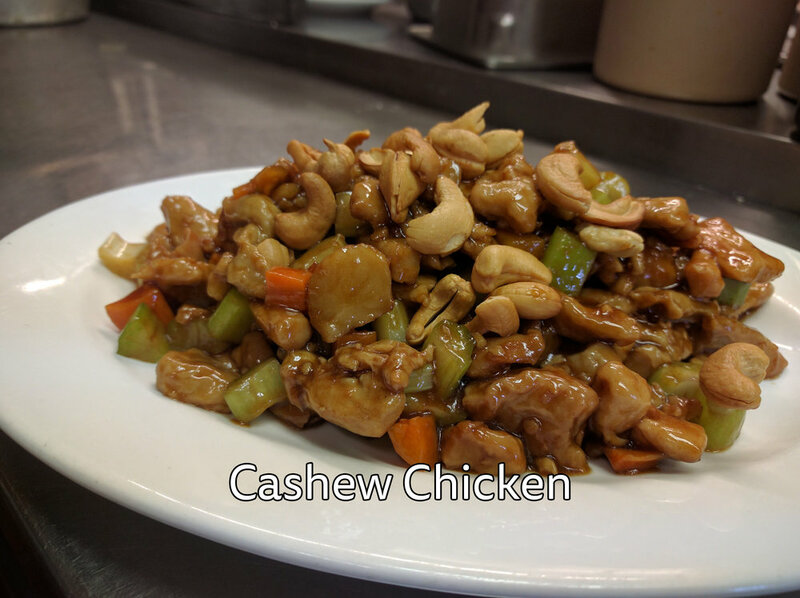 Chicken dark meat stir-fried with crunchy vegetables in brown sauce, topped with cashew nuts. Lightly battered chunks of chicken tender, fried to golden brown, serve with red sweet and sour sauce on the side. Slices of chicken white meat stir-fried with assorted vegetables in white sauce. Chicken dark meat sautéed with carrots, green pepper, water chestnuts, celery and peanuts in pungent brown sauce. Slices of chicken white meat stir-fried with selected vegetables in white sauce. Battered fried chicken tender in a sweet lemony sauce. Slices of chicken white meat stir fried with vegetables in tangy brown sauce. Chicken sautéed with fresh vegetables in a spicy brown sauce. Juicy inside, crispy outside. 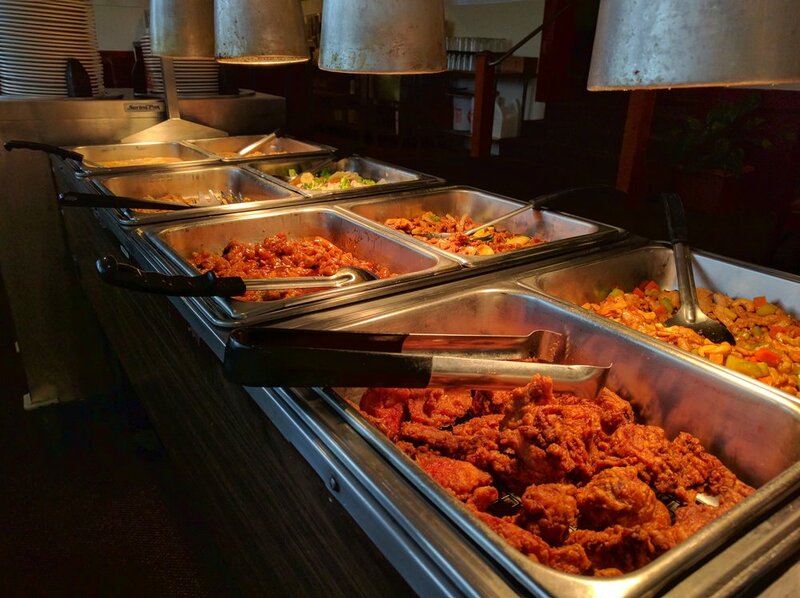 Assorted pieces of bone-in chicken, marinated in a flavorful garlic seasoning and fried. Chicken white meat stir fried with broccoli and carrots in flavorful brown sauce. Slices of chicken white meat stir fried with crisp snow peas in with white sauce. Breaded deep-fried chicken dark meat, tossed in pungent sweet and sour brown sauce. Breaded, bite-sized chicken white meat, cooked in a mildly spiced brown sauce. Chicken white meat stir-fried with shredded cabbage and egg. Lightly breaded chunks of chicken white meat, tossed in zesty tangy orange sauce. All entrees served with rice. Shrimps and selected crunchy vegetables sautéed with peanuts in pungent brown sauce. Fresh scallops stir-fried with assorted vegetables in white sauce. Scallops, broccoli, baby corn, and water chestnuts stir-fried in brown sauce. Shrimp with selected vegetables stir-fried in brown sauce, topped with cashew nuts. Scallops stir-fried with selected vegetables in slightly sweet tangy brown sauce. Shrimps sautéed with vegetabels in spicy brown sauce. Breaded fried shrimp, chicken and pork with a flavorful sweet and sour sauce serve on the side. Shrimps stir-fried with vegetable in slightly sweet, tangy brown sauce. Shrimps with assorted vegetables stir-fried in white sauce. Shrimps stir-fried with broccoli, baby corn, and water chestnuts in brown sauce. Shrimps, green peas, corn, and water chestnuts in a velvety egg sauce. Shrimp, snow peas and water chestnuts in white sauce. Shrimp, scallops and imitation crab meat stir-fried with vegetables in brown sauce. Pork sautéed with cabbage in a flavorful spicy sweet hoisin sauce. Pork slices stir-fried with selected vegetables in a tangy sweet and sour sauce. Pork slices with assorted vegetables in brown sauce. Sautéed with yellow onions and sliced zucchini in a pungent brown sauce. Pork slices stir-fried with vegetables in spicy brown sauce. Sauteed with crunchy vegetables and peanuts in brown sauce. Spicy. Pork slices stir-fried with shredded cabbage and egg. Pork slices tossed with fresh mushrooms and green onions in a lightly sweet and spicy brown sauce. Assorted vegetables stir-fried in white sauce. Assorted vegetables stir-fried in tangy sweet and sour sauce. Vegetables stir-fried in a spicy brown sauce. Vegetables sautéed with egg and shredded cabbage. Fried bean curd with vegetables in brown sauce. Slices of beef stir-fried with vegetables in brown sauce. Tender beef stir-fried with vegetables in spicy brown sauce. Beef sautéed with crunchy vegetables and peanuts in a spicy brown sauce. Beef slices stir-fried with selected vegetables in a tangy sweet and sour sauce. Breaded deep fried beef, tossed in spicy tangy orange sauce. Beef slices stir-fried with shredded cabbage and egg. Breaded deep-fried beef, cooked in a mildly-spiced, sweet brown sauce. 3, eggs and vegetable patties, serve with topping of your choice over brown gravy. 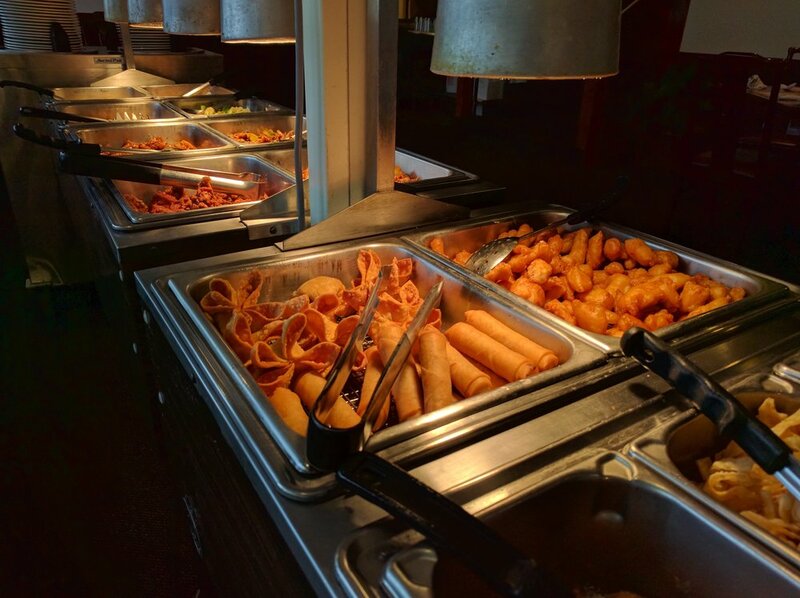 To make any entree a family dinner that comes with Soup, Spring Roll, Crab Rangoon and Rice, just add $2.75 to the entree of your choice. All entree comes with soup and fried rice, and your choice of a Spring Roll or Crab Rangoon ($0.50 for each substitution). Served from 11:00 a.m. - 4:00 p.m., Monday - Saturday.